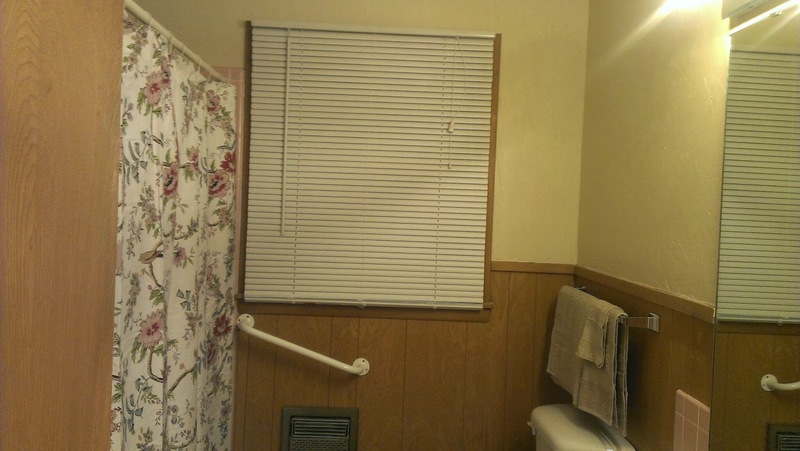 I am sure everyone will be glad to know that my bathroom has been painted and I am done! I did think that I was going to have to go to Home Depot to buy a sample size can of paint to finish. I had to use practically all of the bottom coating of the can because I used the same color as my bedrooms and hall. I was thinking about all the paint my dad poured on the floor and himself while I was painting the hall. Thankfully the lighting isn't that great and you cannot tell how good or bad the coverage is. The new towel racks are up, new shower curtain my aunt found for me hung (I saw hers a few weeks ago and she has the same pink tile), and bath mat I found yesterday on the floor. So much better than the horrid almost neon pink wallpaper.